Some users get the following two error messages when the setup program is almost finished. The installation program selects a suitable printer driver based on the version of Windows. 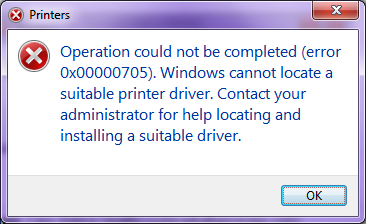 If the setup program is running in compatibility mode then there is a chance that it chooses the wrong printer driver. Choosing the wrong printer driver will result in this error. Make sure that you haven't set any compatibility mode on the setup program or another process that launches the setup program. The setup program can inherit the compatibility mode settings of another program if this program started the setup program itself.